The largest weevil in North America is the palmetto weevil, Rhynchophorus cruentatus Fabricius. The palmetto weevil is native to Florida and until recently was the only species of palm weevil in the continental United States. Once, the palmetto weevil was considered a minor pest, attacking only severely wounded and dying trees. However, it is now known to be a pest of stressed nursery and transplanted palms as well as apparently healthy Canary Island date (Phoenix canariensis Hortorum ex Chabaud), Bismarck (Bismarckia nobilis Hildebrandt & H. Wendl.) and Latan (Latania spp.) palms. The adults of this species display various color variations. They can also be quite variable in overall size. Figure 1. 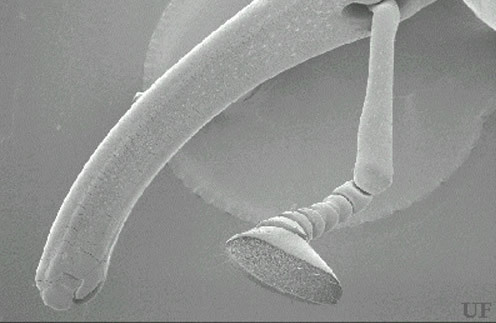 SEM of smooth and ventrally curved adult female rostrum of the palmetto weevil, Rhynchophorus cruentatus Fabricius. Photograph by Robin M. Giblin-Davis, University of Florida. Figure 2. Head (and rostrum) of the palmetto weevil, Rhynchophorus cruentatus Fabricius. Photograph by Michael Thomas, Division of Plant Industry. Figure 3. Lateral view of the palmetto weevil, Rhynchophorus cruentatus Fabricius, with a solid black color. Photograph by Lyle J. Buss, University of Florida. Weevils are a family of beetle that have their mandibles at the end of a, sometimes, very long rostrum (a snoutlike projection of the head). In fact, the rostrum of some weevils (i.e., nut weevils) is as long as their bodies. These modified mouthparts are used for feeding and to prepare holes in host plant material in which eggs are laid. Weevils are a large, diverse and important group of insects. Most feed on plant material, and many are considered to be economic pests. While some adults feed outside the plant, the larvae (or grubs), which have relatively large mandibles and are legless, feed cryptically within the host plant. Worldwide, there are ten described species of weevils in the genus Rhynchophorus that feed on palms. 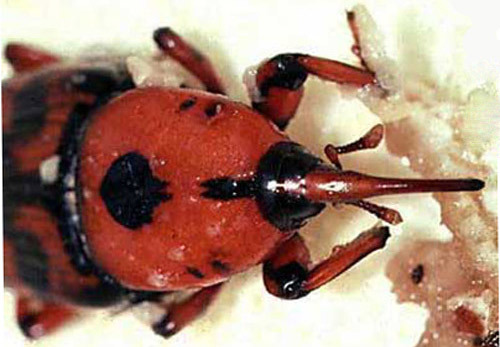 The 'Florida' palmetto weevil, Rhynchophorus cruentatus, has been reported from coastal regions of South Carolina south through the Florida Keys, and west into coastal Texas. It is also present throughout the state of Florida. Fossil records suggest that the palmetto weevil was present in Florida during the Pleistocene (about 1 million years ago). In 2008, it was reported from the Bahamas (Turnbow and Thomas 2008). 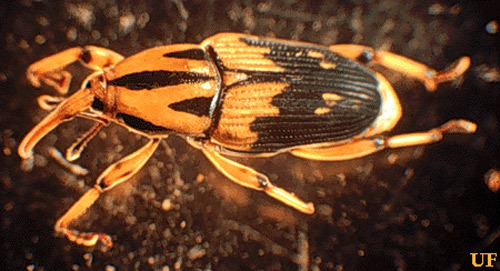 Adults: The adults of the palmetto weevil vary in color from solid black to almost completely red with a variable black pattern. Their total length from the tip of the rostrum to end of the pygidium (the tergum of the last visible segment of the abdomen) ranges from 1.9 to 3.0 cm. Figure 4. Dorsal view of the palmetto weevil, Rhynchophorus cruentatus Fabricius, with a variable black pattern. Photograph by Lyle J. Buss, University of Florida. Figure 5. 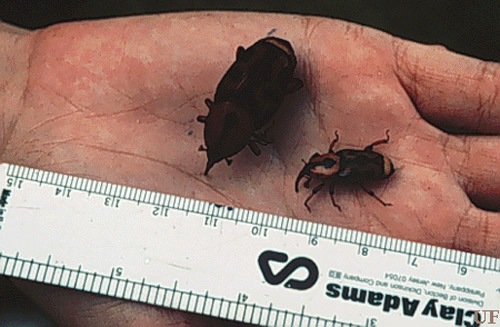 Adults of the palmetto weevil, Rhynchophorus cruentatus Fabricius, showing color and size variation. Photograph by Robin M. Giblin-Davis, University of Florida. Figure 6. Adults of the palmetto weevil, Rhynchophorus cruentatus Fabricius, showing variable size. Photograph by Robin M. Giblin-Davis, University of Florida. Adult males and females can be distinguished by the surface of the rostrum. The rostra of males are relatively straight and covered with tiny bumps while females have a ventrally bowed, tapering, and smooth rostrum. Figure 7. A comparison of the rostra of the female (right) and male (left) palmetto weevil, Rhynchophorus cruentatus Fabricius. Graphic by Robin M. Giblin-Davis, University of Florida. Larvae: The larvae, or grubs, are legless and creamy to yellowish in color. Their prominent head is dark brown and very hard. They have large mandibles. Mature larvae can be quite large, some with a mass close to six grams. While we are aware of no human consumption of palmetto weevils in the United States, larvae of palm weevils are considered a delicacy in other areas. Figure 8. Palmetto weevil, Rhynchophorus cruentatus Fabricius, grubs in palm leaf base. Photograph by Lyle J. Buss, University of Florida. The palmetto weevil has a complete life cycle: with an egg, several larval instars, prepupal, pupal, and adult stages. Eggs are laid in the bases of leaves or in wounds in a dying host palm. In the laboratory, a palmetto weevil female will lay an average of 207 eggs in her lifetime. 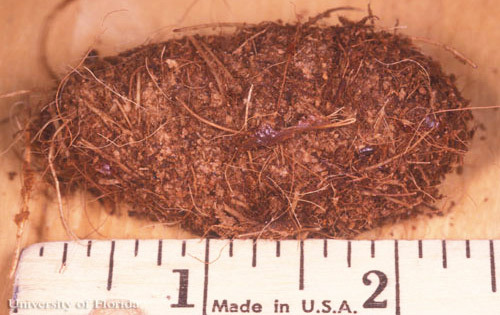 Eggs hatch in about three days and begin to feed on palm tissue. As they molt (grow and shed their cuticle) the larvae have an increasingly larger appetite and tend to feed primarily in the soft tissue surrounding the apical meristem. 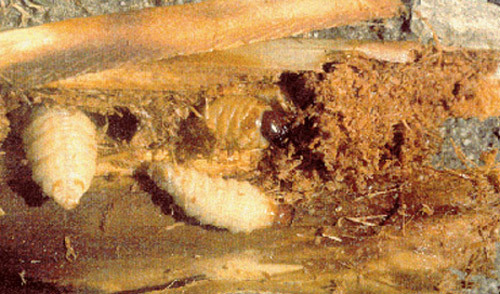 Mature grubs migrate to the periphery of the stem or petioles and prepare a cocoon from palm fibers. After surrounding themselves with the cocoon, the larvae enter a prepupal stage, then a pupal stage. After a few weeks, an adult emerges from the pupal case and may immediately break free of the cocoon or wait within the cocoon for several days to weeks before emerging. The entire life cycle, from egg to adult, takes about 84 days. Adults may live for several weeks to several months as long as moisture is available (up to 26 weeks in captivity). Figure 9. Palmetto weevil, Rhynchophorus cruentatus Fabricius, grubs feeding in palm crown. Photograph by Robin M. Giblin-Davis, University of Florida. Figure 10. 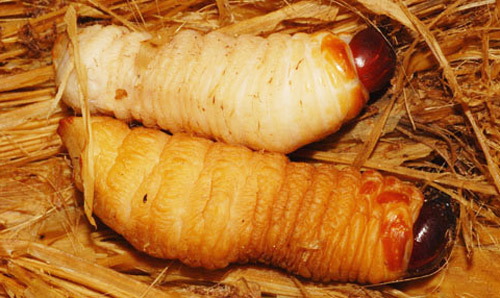 Cocoons (right) of the palmetto weevil, Rhynchophorus cruentatus Fabricius. Photograph by Robin M. Giblin-Davis, University of Florida. Figure 11. Pupal case of the palmetto weevil, Rhynchophorus cruentatus Fabricius. Photograph by Lyle J. Buss, University of Florida. Palmetto weevil adults are active fliers and can be found throughout the year in Florida. However, adult activity is usually more noticeable in the late spring and early summer months and least noticeable in the cool and dry winter months. When not flying in search of a host palm, adults hide between the leaf bases and stems of healthy palms presumably to conserve water within their bodies. The palmetto weevil is closely associated with the cabbage palmetto (Sabal palmetto (Walker) Loddiges ex J.A. et Schultes), a palm native to the southeastern U.S. In addition, the native saw palmetto (Serenoa repens (Bart.) Small) appears to be an acceptable alternate host. Several other palms, most of them introduced species, have been observed with larval infestations. These include the Canary Island date palm (Phoenix canariensis Hortorum ex Chabaud), Phoenix dactylifera, bismarck palm (Bismarckia nobilis Hildebrandt & H. Wendl. ), Pritchardia sp., Washingtonia sp., royal palms (Roystonea sp. ), latan palms (Latania spp. ), coconut palm (Cocos nucifera Linnaeus), Florida thatch palm (Thrinax radiata Lodd. ex Schult. & Schult. 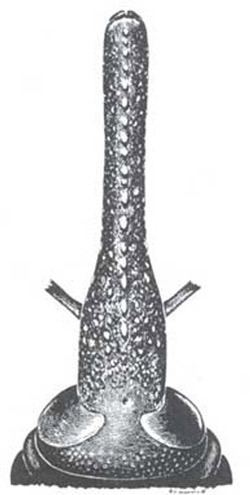 f.) and Caryota sp. In undisturbed locations, palms are rarely observed with palmetto weevil infestations. 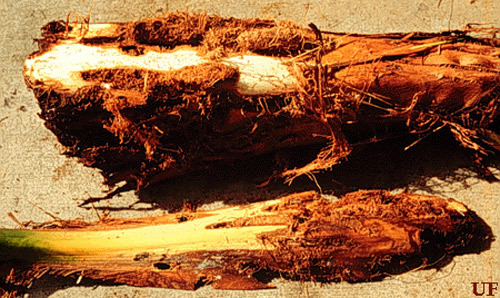 Trees struck by lightning have been observed with subsequent weevil infestations. The palmetto weevil has, in recent years, caused considerable damage to some newly transplanted or otherwise stressed palms as well as apparently healthy Canary Island date (Phoenix canariensis), bismarck (Bismarckia nobilis), and latan (Latania spp.) palms. The symptoms of a palmetto infestation vary, but commonly involve a general, often irreversible decline of younger leaves. In palm species with upright leaves, such as the Canary Island date palm, the older leaves begin to droop during the early stages of infestation but quickly collapse thereafter. As the infestation progresses, the larval feeding damage and associated rot is so severe that the integrity of the crown is compromised and the top of the palm falls over. This condition is termed "popped neck". If the palm is pulled apart at this stage, larvae, cocoons, and even adults may be found within the crown region. Early detection of weevil infestation is difficult, and treatment even in the early stages of infestation may be too late to save the tree depending upon the amount of damage to the apical meristem. This area needs more study, however. Figure 12. Damage to Canary Island date palm by larvae of the palmetto weevil, Rhynchophorus cruentatus Fabricius. Photograph by Robin M. Giblin-Davis, University of Florida. Figure 13. 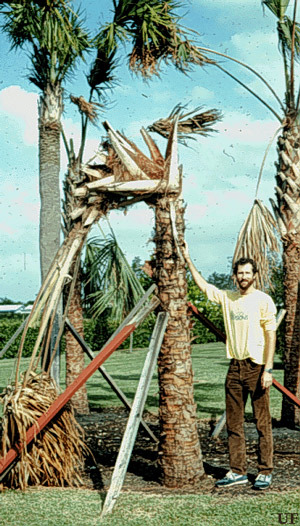 Sabal palm exhibiting "popped neck" condition due to damage by the palmetto weevil, Rhynchophorus cruentatus Fabricius. Photograph by Robin M. Giblin-Davis, University of Florida. In the early 1980's, the silky cane weevil (Metamasius hemipterus sericeus (Oliver)) was accidentally introduced into Dade County, Florida. This insect is an important pest of sugarcane and other plants, including palms, in the Neotropics. Adults are attracted to and lay eggs in palm sheaths, petioles, or stems. Within the host, larvae develop into adults in less than two months. Figure 14. Adult silky cane weevil, Metamasius hemipterus sericeus (Oliver). Photograph by Robin M. Giblin-Davis, University of Florida. Silky cane weevil adults appear to be attracted to palms by odors emanating from small wounds, such as those created by pruning leaves. 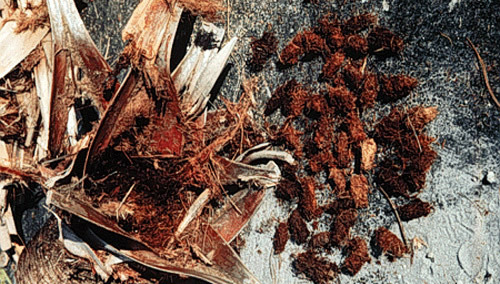 While initial infestations of palms by the silky cane weevil is not usually lethal, we believe that the stress created by the infestation makes these palms susceptible to successful attack by the palmetto weevil. This association also needs further study. Volatile odors emanating from stressed, wounded or dying palms are attractive to palmetto weevil adults. The exact number and ratios of volatile compounds released from wounded trees are unknown but several compounds, known collectively as "palm esters" have been found to be attractive. In addition, an aggregation pheromone (5-methyl-4-octanol, or "cruentol") produced and released by male weevils attracts other male and female palmetto weevils. Neither the "palm esters" or cruentol are very attractive by themselves. But when put together, they are synergistic, attracting many adult palmetto weevils. As the story may go, a palmetto weevil adult male flying amongst many palms locates an attractive odor given off by a suitable, stressed, or dying palm. He flies upwind towards the odor source and eventually lands on the potential host palm. As he begins to feed he releases the aggregation pheromone which is attractive to other weevils at long distances. Other weevils fly towards the pheromone source, and as they get closer, the pheromone/"palm esters" mixture takes over to guide them to the host. As more males land on the host, they also release pheromone attracting even more males and females. Once a population has gathered on the tree, mating and egg laying take place. Insecticidal treatment of trees infested with the palmetto weevil is difficult, owing to problems with detecting a weevil infestation before lethal damage is done to the crown. The best recourse is to cut down infested palms and destroy them before adults emerge from the tree. Prophylactic treatment of recently transplanted palms with insecticides is an option but the costs can quickly become prohibitive unless only a few trees are to be protected. Curative and preventative treatments with systemic neonicitinoid insecticides is possible, but requires vigilance and persistence. Growers managing nursery plantings of palms may have the greatest potential to control the palmetto weevil by an integrated program. First, trees should be grown using cultural practices that promote vigor. This means following proper fertilization and irrigation guidelines. Trees such as the Canary Island date palm are not adapted for the south Florida climate. Great care should be taken to ensure the health of these trees. Secondly, wounding of trees, such as by pruning, should be avoided. Following these two steps may help to prevent an infestation. 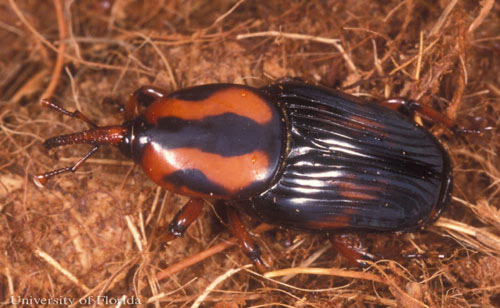 If trees are infested with palmetto weevils, there is little if any chance of saving them. Therefore, sanitation, as in removing and destroying infested plant material is crucial in preventing or reducing subsequent infestations to adjacent palms. In January 2010, the federal government prohibited the importation into the United States of live palms belonging to 17 genera, since it is it is suspected that the weevils are spread with imported palms (Turnbow and Thomas 2008). Figure 15. 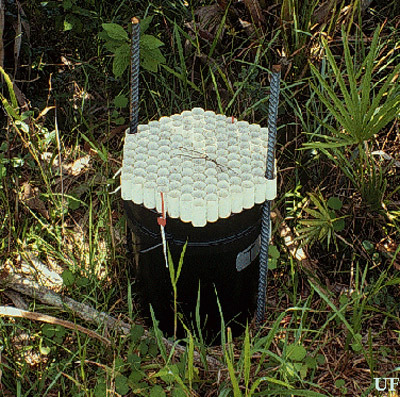 Bucket trap used to capture and monitor palmetto weevil adults. Photograph by Robin M. Giblin-Davis, University of Florida. Brown SH. (2009, December 8). Palmetto weevil in Bismark palm [video]. www.youtube.com. (26 April 2013). Giblin-Davis, R M, Faleiro, JR, Jacas, JA, Peña, JE, and Vidyasagar, PSPV. 2013. 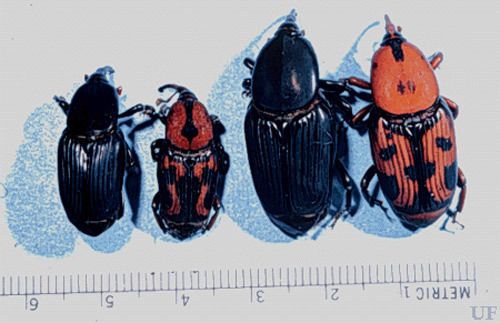 Coleoptera: Biology and management of the red palm weevil, Rhynchophorus ferrugineus. In: Potential Invasive Pests of Agricultural Crop Species (J. E. Peña, ed.). CABI books. Giblin-Davis RM, Howard FW. 1989. Vulnerability of stressed palms to attack by Rhynchophorus cruentatus (Fabricius) (Coleoptera: Curculionidae) and insecticidal control of the pest. Journal of Economic Entomology 82: 1185-1190. Giblin-Davis RM, Oehschlager AC, Perez A, Gries G, Gries R, Weissling TJ, Chinchilla CM, Peña JE, Hallett RH, Pierce, Jr HD 1996. Chemical and behavioral ecology of palm weevils. Florida Entomologist 79. (26 April 2013). Giblin-Davis RM, Peña JE, Duncan RE. (1994). Lethal pitfall trap for evaluation of semiochemical-mediated attraction of Metamasius hemipterus sericeus (Coleoptera: Curculionidae). Florida Entomologist 77. (26 April 2013). Giblin-Davis RM, Peña JE, Duncan RE. 1996. Evaluation of an entomopathogenic nematode and chemical insecticides for control of Metamasius hemipterus sericeus (Coleoptera: Curculionidae). Journal of Entomological Science 31: 240-251. Giblin-Davis RM, Weissling TJ, Oehlschlager AC, Gonzalez LM. (1994). Field responses of Rhynchophorus cruentatus (Coleoptera: Curculionidae) to its aggregation pheromone and fermenting plant volatiles. Florida Entomologist 77. Hunsberger AGB, Giblin-Davis RM, Weissling TJ. (2000). Symptoms and population dynamics of Rhynchophorus Cruentatus (Coleoptera: Curculionidae) in Canary Island date palms. Florida Entomologist 83. (26 April 2013). Meerow AW, Weissling TJ. (1998). Pests of Palms in Florida and the Caribbean. (26 April 2013). Thomas MC. (February 2010). 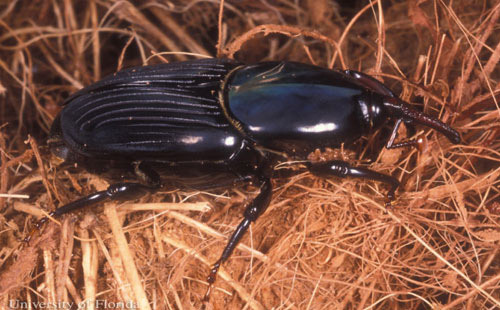 Giant palm weevils of the genus Rhynchophorus (Coleoptera: Curculionidae) and their threat to Florida palms. FDACS-Division of Plant Industry. (26 April 2013). Turnbow RH, Thomas MC. 2008. An annotated checklist of the Coleoptera (Insecta) of the Bahamas. Insecta Mundi 0034: 1-64. Vanderbilt CF, Giblin-Davis RM, Weissling TJ. (1998). Mating behavior and sexual response to aggregation pheromone of Rhynchophorus cruentatus (Coleoptera: Curculionidae). Florida Entomologist 81. (26 April 2013). Weissling TJ, Giblin-Davis RM. 1993. Water loss dynamics and humidity preference of Rhynchophorus cruentatus (Coleoptera: Curculionidae) adults. Environmental Entomology 22: 93-98. Weissling TJ, Giblin-Davis RM. (1994). Fecundity and fertility of Rhynchophorus cruentatus (Coleoptera: Curculionidae). Florida Entomologist 77. (26 April 2013). Weissling TJ, Giblin-Davis RM, Center BJ, Hiyakawa T. 1994. Flight behavior and seasonal trapping of Rhynchophorus cruentatus (Coleoptera: Curculionidae). Annuals of the Entomological Society of America 87: 641-647. Weissling TJ, Giblin-Davis RM, Gries G, Gries R, Perez AL, Pierce HD, Oehlschlager AC. 1994. Aggregation pheromone of palmetto weevil Rhynchophorus cruentatus (Coleoptera: Curculionidae). Journal of Chemical Ecology 20: 505-515. Weissling TJ, Giblin-Davis RM, Scheffrahn RH. 1993. Laboratory and field evidence for a male-produced aggregation pheromone in Rhynchophorus cruentatus (Fabricius) (Coleoptera: Curculionidae). Journal of Chemical Ecology 19: 1195-1203. Woodruff RE 1967. A giant palm weevil, Rhynchophorus cruentatus (Fabricius), in Florida (Coleoptera: Curculionidae). Florida Deptartment of Agriculture Division of Plant Industry Entomology Circular No. 63. (26 April 2013). Publication Date: August 1997. Latest revision: January 2015. Reviewed: February 2019.